Having recently retired, our thoughts turned to updating our wills. We have always been extremely grateful for the support and advice we received from others when our son James was diagnosed with aniridia back in 1979. Back then there was very little information around and as it is a rare condition we struggled to really understand what the future held and what we could do to best support James as he grew up. If Aniridia Network had existed at that time, there would have been so many more people we could have shared our thoughts with and we would not have felt so alone. So with this in mind we have made a decision to leave a legacy in our wills to Aniridia Network UK and the RNIB. We will also be making a regular donation to Aniridia Network UK to support their work- after all you can’t take it with you! 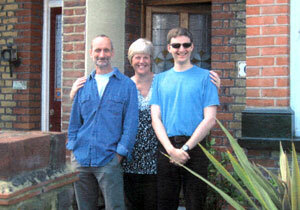 Aniridia Network UK is extremely grateful to Peter and Lyn for their generosity and forethought. Why not set up you own regular donation to us right now online? And please think of us when writing your will too. This entry was posted in Fundraising, Parents' accounts and tagged fundraising, legacy, regular donation, will. Bookmark the permalink.